Malheureusement dans cette occasion je ne peux pas collaborer parce que je suis à Varsovie en participant dans l’EVPMC (lien ici). Aussi à Brussels (lien ici, et trouvez le programme ici). Bonne nuit européenne des chercheur.e.s! Ready for the 11th European Vertebrate Pest Management Conference! Next week I (Javier) will be in Warsaw (Poland) to attend to this Conference. Click here to get to the website of the conference. In addition, you will find the scientific programme here. I will show the following presentation that you already have in this blog (click here) or in YouTube (click here), but with some modifications like adding more results of the exposure to bromadiolone of voles and small mustelids. 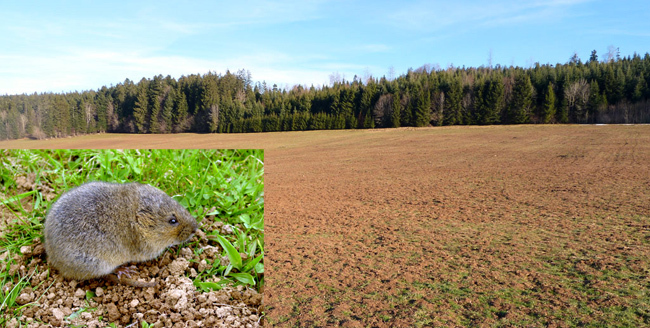 In this regard, I briefly explain here that with the collaboration of the FREDON Franche-Comté voles were trapped in our study sites and then dissected to get their livers and determine whether they have been exposed to bromadiolone. For the small mustelids, this exposure to bromadiolone was tested by collecting their scats in the surroundings of the footprint tracking tunnels with visits of small mustelids. We strongly recommend reading a recent article published by our collaborator Isabelle Fourel and other co-authors from Vetagro-Sup. Click in the bibliographic reference to get to the link of this study. Fourel, I., Damin-Pernik, M., Benoit, E., & Lattard, V. (2017). Core-shell LC–MS/MS method for quantification of second generation anticoagulant rodenticides diastereoisomers in rat liver in relationship with exposure of wild rats. Journal of Chromatography B, 1041, 120-132.